Belated thanks to everyone who took the Halloween Extras class at Impress - hope you liked the designs and techniques. We had so many great stamps and dies to chose from - I could go on making Halloween cards for a few more weeks - but the 31st is just a few days away! Here's a super-quick card for you - just diecut Cityscape Nightline, using the Metal Adapter Plate with the other plates required for thin metal dies, from Parchment Cardstock and ink the edges with Khaki. Cut a 3.75" x 5" piece of the Blackbird 6x6 print and ink the edges with Khaki too. Use a screwpunch to punch some holes in the center of the starbursts. Attach packing tape behind the print. Brush Peridot Glitter onto the adhesive in the holes. Coordinate your instant-card with a matching Licorice Envelope. Use scraps of the Mango Moroccan print for handwritten address labels. If you love Memory Box Dies (and who doesn't?) - be sure to see the Poppystamps collection of dies - including some new designs - here. Thanks for stopping by - hope you enjoyed the Halloween cards posted during the past few weeks! Here's a switch from holiday reds and greens...try Boysenberry, Dove Gray, Parsley and Key Lime for a cool, contemporary look. The new Woodland Christmas Tree G1898 is great for embossing with Clearsnap's ColorBox Frost White Pigment Ink and detail white embossing powder. The combination creates an opaque, delicately-detailed tree to highlight with Sparkling Amethyst Glitter. The Parker Lower Alphabet 98363 set works with any design - and is great with felt, vellum and lightweight chipboard too. I'll be sharing a few Halloween and Fall ideas next - view the new items in our Holiday 2012 Collection here. Here are just three of my favorite new dies - Snowflake Tree 98405, Ornament Border 98417 and Parker Lower Alphabet. There's such a great selection it's hard to pick just one favorite! The intricate dies like the tree are easily cut with the Metal Adapter Plate and the other plates required for thin dies. Save the tree cutout - we'll use it on another card soon. View the Holiday 2012 Collection here. Here are a few of the cards we'll be making in the Merry Merry Memory Box class at the Tukwila Impress on Sunday August 12th - combining the newest stamps and dies and some shimmery, glittery papers that they've found for the holidays. Please call Impress (206 901.9101) to reserve a space if you can join us. I love purples, greens, wildflowers and collage stamps - it was a pleasure gathering these supplies to create this card for you! The intricate new Honeyblossom Spring Die 98333 and Crisp Bows Die Set 98197 (a favorite from an earlier holiday release)were cut using the Metal Adapter Plate along with the other plates used for thin metal dies. You don't need those fussy paper or cardstock shims anymore. It's easy to see that my Journey Collage G1733 stamp has been on a quite a few journeys. I used to be able to artfully arrange my supplies to hide the ink smudges covering my stamp - not anymore! The prints from the Viola 6x6 Set are perfect for the flowers and accent strips. Don't you just love it when everything comes together so easily? View the Summer Collection here. Impress' new summer class schedule is on their website right now - Theresa Laurent, Memory Box Design Editor, and I can't wait to start our new classes. Here are a few of mine...Birthdays Happen!, Tags in a Tin, Holiday Headstart, Monoprints and More, Just a Thought, Merry Merry Memory Box 2012 and Memory Box Calendar. I'll be posting the details on our Design Team Classes blog soon. Whisper Print Daisy F1863 is one of four just-released botanical stamps from the Memory Box Summer Collection. Use it in a number of ways - it can be bold, subtle, contemporary, or vintage, and great for any occasion. Vintage Dreams G1838 creates the perfect background and Happiest Birthday B1354 adds the finishing touch. The entire card takes about 10 minutes, using fast-drying ColorBox Grasshopper, Frosted Plum and Tree Frog Archival Dye Inkpads for the background, flower and greeting. The stamped pieces were edged with Grasshopper and foam dots were brushed with Clearsnap's Sparkling Amethyst Glitter. 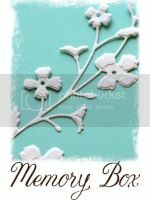 The Mini Picket Fence Die 838 from Poppystamps creates a quick border from Parsley Cardstock - like those little wire edgers designed to keep dogs out of the flower beds. It's about 5-1/2" long, and diecutting it was a breeze with the Metal Adapter Plate and the other plates used for thin dies. A 2-3/8" x 5" strip of the dotted print from the Viola 6x6 Collection adds a contrasting pop of color. The A6 card (4-5/8" x 6-1/4") is cut and folded from Juicy Cardstock. See the other Whisper Print stamps and new Memory Box Dies here. View the new Poppystamps Dies too. There are so many great new items - to feature as the main design element, or mix with classic favorites from previous releases. I'll be using them in my new classes this summer. A glittered diecut songbird perches on a delicate branch to welcome Spring today in Seattle today! I love how the Poppystamps Nestled Bird 817 works perfectly with the Memory Box Leafy Branch Globe E1850. The watercolor-y background is simple, quick and always unique. It's a blend of inks from the Colorbox Playground Multi-Color Inkpad, spritzed with water. Create a stash of these backgrounds and have them ready for your next Memory Box moment. Here are 3 of the cards from the next Beyond the Box class, at the Tukwila Impress on April 29th. We're using our favorite Memory Box stamps, dies and papers and taking them beyond everyday designs with a variety of inking, layering and stamping techniques.